Today on CapeCast: The National Marine Life Center in Buzzards Bay has become a nursey for a half-dozen endangered Northern red-bellied cooters. Watch them wiggle and wow. BUZZARDS BAY — Out in the wild, tiny northern red-bellied cooters would most certainly be lunch for skunks and raccoons. But six turtles with fire-colored tummies were more eaters than entrees yesterday as they devoured shreds of lettuce like termites tearing through wood. The undersized bunch arrived at the National Marine Life Center in Buzzards Bay two weeks ago with the goal of getting fatter — or at least big enough to be safely released back into their natural freshwater habitat. In Massachusetts, northern red-bellied cooters are native only to Plymouth County — at least 250 miles north of where most of the species resides in mid-Atlantic states. The species is endangered in Massachusetts and classified as threatened on a federal level, said Don Lewis, the center’s chief operating officer. Nearly 100 percent of northern red-bellied cooters that hatch in the wild are eaten by predators such as skunks, raccoons, herons and bullfrogs, according to the U.S. Fish and Wildlife Service Web site. Those dire survival numbers prompted federal and Bay State wildlife officials to set up a “head-starting” program for the turtles. Research biologists find red-bellied cooter nests and protect them with screens. When hatchlings start to emerge from a nest, biologists remove half of them and take them to marine rehabilitation centers where they are fed and kept warm for about eight months. They are then released to pond and river habitats. 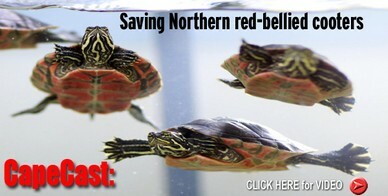 Red-bellied cooters that get a head start have a high rate of survival, according to the wildlife service. Lewis said the center’s cooters, which were born in October, are healthy and will be released when they are “hockey-puck size,” likely within a month. 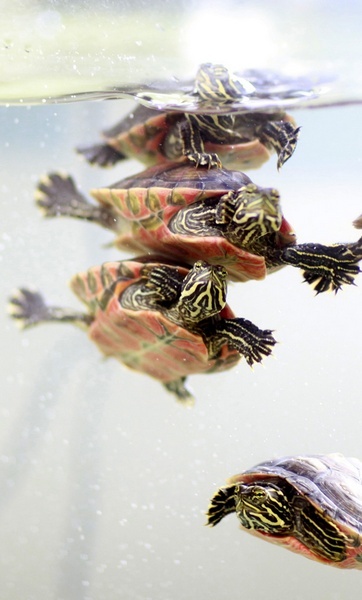 You are currently browsing the Turtle Journal blog archives for June, 2009.